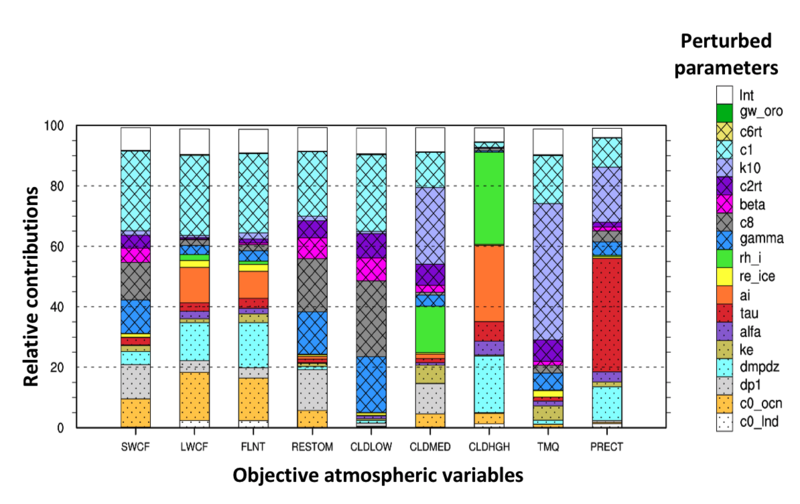 The relative contributions—importance—of 18 parameters and their interactions for nine objective variables in the E3SM Atmosphere Model. The study provides a unique strategy to sharpen understanding of the behavior and physics within the model’s atmospheric component. The atmospheric component of the U.S. Department of Energy’s recently released Energy Exascale Earth System Atmosphere Model version 1 (EAMv1) includes many new features to improve modeling of water cycle processes. Nonlinear interactions among the new features create a significant challenge for understanding EAMv1’s behavior and tuning the various parameters in the physics parameterizations. 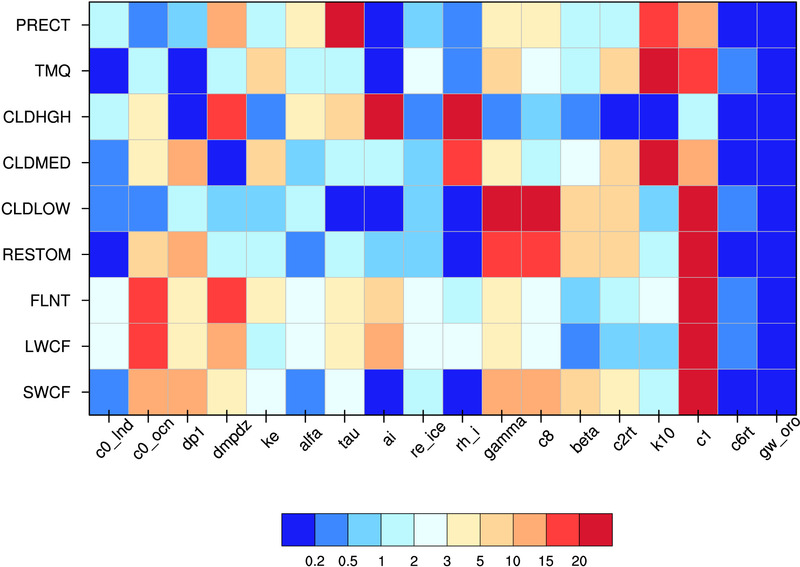 Researchers at DOE’s Pacific Northwest National Laboratory led an effort to understand and quantify structural errors and identify the most influential parameters within EAMv1. Scientists quantified the simulation sensitivity to those parameters by designing and conducting short ensemble simulations, which provided an opportunity to evaluate and optimize model fidelity in a systematic and computationally efficient manner. Relative significance (based on the relative contribution in percentage to the total variance) of each parameter for the nine object variables analyzed by he generalized linear model based on the perturbed parameter ensemble simulations. Larger number (warmer color) indicates higher level of significance. This research was supported as part of the Energy Exascale Earth System Model (E3SM) project, funded by the U.S. Department of Energy (DOE) Office of Science, Office of Biological and Environmental Research Earth System Modeling program. B.Y. at Nanjing University was supported by the National Natural Science Foundation of China (41675101). V.L. at UWM was supported by grant DE-SC0016287 through a Climate Model Development and Validation (CMDV) project funded by the Office of Biological and Environmental Research in the DOE Office of Science. This research used high-performance computing resources from the Oak Ridge Leadership Computing Facility at Oak Ridge National Laboratory, supported by the DOE Office of Science under contract DE-AC05-00OR22725, PNNL Institutional Computing, and the National Energy Research Scientific Computing Center (NERSC), a DOE Office of Science user facility supported under contract DEAC02-05CH11231.